The art of teaching is a complex process, which is not limited to transferring of knowledge from one to another. It requires good verbal and non-verbal skills. It includes various techniques in order to transfer knowledge effectively. Not everyone can master it. With the vast growth in all sectors, effective teaching skills are in great demand. Therefore, due to this demand, the concept of micro teaching came into action. It is a new innovative program for teachers, which enhances their classroom attitude and behavior. Many pre-primary education institutes have taken up micro teaching practices in order to equip teachers with effective method of teaching. Micro teaching revolves around certain principles to improve its reach in all round development of the teachers. In skills in microteaching are targeted one at a time. Training on particular skills are given until it is mastered. Once mastered another skill is targeted next. Thus, micro teaching aims for one skill at a time. Limiting the content gives more freedom and ease to the trainees. Thus, micro teaching is based upon the principle of limited content. Teachers are to prepare their lessons within the given content therefore it becomes easier for them to conduct their lessons. Mastering skills require practice. While focusing on one skill at a time, micro teaching program also gives an opportunity to practice those skills. Lots of practice can boost the self-confidence and promote in development of teaching skills. Experiments are the key factors in any concept. In micro teaching, many experiments are conducted in order to test the skills of the teachers. For example, the supervisors conduct experiments where the length of the lessons, time duration, strength of students in the class etc is changed. These skills are tested under controlled condition. Micro teaching consists of teacher-pupil and supervisor as students. Once a session ends, teacher-pupil and supervisors come up with their feedback. This feedback is given instantly after the lesson plan ends. Thus, it helps in rectifying the drawbacks. Evaluation plays an important role in any task. In micro teaching, supervisors conduct various test and thus there are several chances to analyze mistakes. Evaluation gives an opportunity to understand the mistake and overcome it. This program includes a session where drawbacks are pointed out along with their solution. Thus, overall improvement becomes an easier target. Acquiring and mastering skills is a slow and ongoing process. Even after mastering a previous skill, one should continually strive for betterment. Continuous efforts makes it easier to attain overall development. Micro-Teaching is a special teaching practice model or teaching training method. In this teaching context, there contains many actions like use of methods, usage of media, learning guide, motivation, classroom management, assessment, analyzing and so on. The exercise which is designed focuses mosly on the basic teaching skills with the help of feedback based on the knowledge and information of student learning level. The teaching is conducted for students who are from different backgrounds and their intellectual abilities. Enabling the prospective teachers to learn effective teaching skills. Helping the students to actively participate in teaching by providing low risk situation. The pupil teacher or the supervisor defines a certain skill. The skills of micro teaching are defined regarding the teaching behaviors in order to procure knowledge of required skills, which they have to focus on. Demonstration is the second step in the process. Experts demonstrate the specific skill by themselves or with the help of audio\video tape recordings to the teacher trainee. This gives an idea to the teachers to work accordingly. This step is the first action by the student teacher. The trainee teacher plans a short lesson through which he/she could practice the skill. This microteaching lesson plan is done with the help of his supervisor. Once the planning is done, according to the targeted skill the pupil-teacher teaches the planned lesson to the group of students. These lessons are observed by supervisor and pupil teachers. Further, they are video-taped, audio-taped, or televised through a CCTV camera. These tapes are later used for self-evaluation as well. Once the teaching session comes to an end it is followed by a concluding session. Concluding session consist of feedback by the supervisor. During this session, the audio or video recording may also be displayed in order to give an opportunity to evaluate oneself. Moreover, it also boosts the confidence level of the trainee. It is the best way to reinforce the trainee to work better the next time. Mastering a skill is an ongoing process. Thus, once the cycle of micro teaching revolves, the process is repeated. This repetition involves re-planning of the lesson plan. The aim of this re-planning is to master the skill mentioned earlier. On completion of the re-planning of the lesson, it is again taught to another group of students from the same class. The time duration is kept as same as the previous class. This method contributes in practicing the skill repeatedly. At the end of re-teaching session, the discussion and conclusion step is repeated. These discussion and suggestions encourages the performance of the trainee. Thus, the process of feedback is procured to enhance the performance further more. After the end of every session, this cycle is repeated. The repetition is continued until the required skill is mastered. This process is repeated while attaining all the required skills. Thus, we can conclude that micro-teaching involves the 4R’s viz, Recording, Re-teaching, Re-discussing and Redoing. This is the first phase of micro teaching. It includes collection of data. In this phase, the trainee teacher gathers knowledge about the required skills by reading different literature as well as going through certain demonstrating videos. Further, this phase includes the understanding of required skill in a rational manner, as a classroom component. This is the working phase of micro teaching program. Under this phase the trainee teacher is asked to prepare lessons and practice, skills based on the model presented at the start. Here two factors are of major importance of micro teaching i.e. the feedback and the setting. Setting includes the length of the lesson, the duration of the class, the skill to be obtained, supervisor and the students. This is the last and major phase of micro-teaching. Here the trainee comes out in a real situation, which is not controlled. Here the teachers as well as the students get the platform to learn and grow. This takes place in a real classroom, unlike the previous stages of micro teaching. Micro-teaching helps in developing various skills in trainees as well as the current teaching staff. It helps in improving the handling skills of the teachers. It gives better opportunity due to small-scale teaching. Moreover, it broadens the knowledge of various techniques of teaching. Micro teaching is a personality enhancer too. Due to several micro teaching activities and practices, micro teaching effectively increases the confidence level of the teachers. Moreover, the experience of teaching enables them in better classroom management. Unlike other various programs and seminars that are very costly, micro teaching program is budget oriented. Teachers can practice within the real class or at any other place. Micro teaching program is conducted with not more than 3-4 students at a time. This makes it possible to acquire a better teaching experience. In addition, it lessens the chances of mistakes. A positive attitude contributes to better results. Thus, one of the objectives of this program is to guide the trainees to attain a positive attitude towards any criticism. As a result, negative feed backs also motivate the trainees to strive for betterment. Lesson planning is one of the skills that a teacher needs to master. Micro teaching program, within a given content, helps the trainee to prepare systematic lesson plans. Feedbacks are the best way to improve. 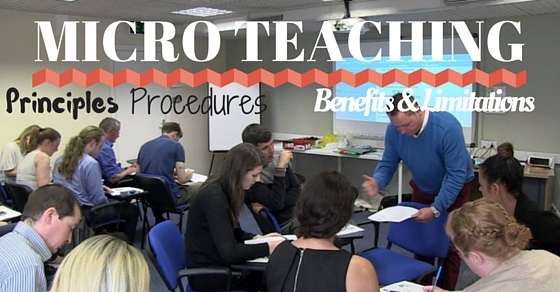 Micro teaching enables the teachers to gain instant feedbacks from the supervisors. An instant feedback gives more potential for rectifying mistakes. This program helps in mastering types of micro teaching skills and strategies like lecturing, questioning, probing and initiating discussions. Further, it helps in improving a separate teaching style. The following mentioned are few micro teaching limitations. Creativity is the core of any job. It flows along with the task. However, in process of micro teaching, due to limited period, it becomes difficult to bring out that creativity. Thus, micro teaching does not contribute in increasing the bars of creativity. Better teaching promotes better learning experience. Similarly, for better teaching one needs to undergo better training as well. Micro teaching course benefits teachers in gaining that experience, but it requires well-trained educators to train the teachers. Without a proper educating staff, it is impossible to implement micro teaching course. Teaching is an art. However, not everyone is capable of teaching. Any job needs passion and interest. They play a key role in driving the person to strive for improvement. In micro teaching program, there are maximum 3-4 students therefore lesser students fail to motivate the teacher to improve. Instead there are chances of teachers losing their interest altogether. Micro teaching is teacher oriented activity. Here in, the focus is on improving efficiency in teaching techniques. Each session lasts around 5 – 10 minutes minimum. During this period, the aim is to develop teaching skills and thus student learning is ignored. It certainly wastes the time of student, as it does not benefit him. Further, for practicing several times, various students are called at different period. This may also hamper their overall academic performance. Thus, it is advisable to conduct the training program keeping in mind all the factors. Micro teaching program is undoubtedly a benefiting course to the teaching staff. It is a promising method for the holistic development of the teachers in the teaching field. However, there is one minor drawback of this program. The training period is not enough to develop all the required skills properly. In addition, one trainee needs approximately 35 minutes to practice once. Not more than ten trainees can practice once within five hours. It is certainly a time consuming program. Micro teaching is a very advanced form of learning however; it does have its own limitation. When it comes to teaching a diverse level of students at once, it becomes a hassle. During the training, the strength of the students is limited however when the strength of students is increased it seems like a problem. This program manages to keep the teachers away from the real classroom problems. As a result, trainees struggle in maintaining classroom behavior. Moreover, artificial situation do not help in preparing teachers for real time situation. Micro teaching is a concept innovated at Stanford University by Professor Robert Bush and Dwight Allen. One of the principle of micro teaching is skill enhancement. However, these skills are targeted one at a time and so not all skills are developed within the given period. Thus, integration of different micro teaching techniques is needed. Apart from the skills, micro teaching involves only one trainee at a time. For a single session of training, it requires approximate 35 minutes. Thus, single trainee can practice only once in 35 minutes. It is not only time consuming but also an irritating process for the supervisors if there are more then ten trainees in a batch. Micro teaching is indeed an advanced level of teaching program that enables the teachers to gain confidence before stepping into the profession of a teacher. With the vast impact of globalization on every aspect of the world, there is certainly need of various schools. Efficient and effective teaching is one of the major factors parents look at before enrolling their children into a school. Thus, implementing a micro teaching programs for new teachers as well as in service teachers are an ideal way to set foot with the world. Pros and cons are a part of every innovation and thus keeping in mind those aspects one should opt for the suitable program. Micro teaching is a widely accepted technique adopted and approved by various institutions. Previous articleHow to Evaluate Candidates after an Interview?